The Outlaws posted two wins this past week to continue their winning streak; a win at North Marion (NM) on April 3 and a home victory over Henley on Friday. That’s in addition to a very satisfying tournament victory in Madras. Sisters earned its first league victory with a 7-1 win at NM, and improved their overall record to 4-1. Coach Carl Click told The Nugget that experience is paying off for the Outlaws. They have 10 returning players in the lineup and dominated North Marion, who only has a few returnees. Nate Weber, Jed Kizziar, Isaiah Chapen and newcomer Keaton Green swept the singles matches, all in straight sets. Weber defeated Gage Hurst 6-4, 6-0, Kizziar defeated Justin McConkey 6-2, 6-1, Chapen beat Tate Durst 6-0, 6-1, and Green beat Ja Levine 6-1, 6-0. The Outlaws also won three of the four doubles matches. Aaron Johnson and Sam Mayes needed a tiebreaker to win their first set at No. 2 doubles, and then won a close second set, 7-6, 6-4, to take down Leo Duarte and Kyle McConkey. George Bates and Drew Collins-Burke cruised to a 6-2, 6-2 win over Ethan Gianella and Dylan Herron in No. 3 doubles. Cole Seymour and newcomer Aspen Geisen needed a tiebreaker win in the first set, and prevailed at No. 4 doubles over Sean Harris and Kevin Rojas with scores of 7-6, 6-2. On Friday, after waiting for a break in the rain and using squeegees on the courts, the Outlaws got in their home match with Henley, and walked away with a 5-1 win. It was a big turnaround from a year ago when the Hornets swept the Outlaws 7-0. Weber and Chapen both won their singles matches. Nate improved to 4-2 this season with his 6-0, 6-4 victory over Jubal Rasmussen. Click told The Nugget that Weber can out-hit most every opponent, but is most effective when he plays intelligent, controlled points. Isaiah continued with his crafty style of play with lots of targeted shots and backspin, and defeated Sean Wolf 6-2, 6-4, to improve to 5-1 in singles matches. Keaton Green put up a good fight at No. 4 singles, but lost in a third-set super tiebreaker, 9-11, to Kaulin Froebe. Eli Gurney and Brogan Petterson played their best match of the season, and defeated Thys Dehoop and Riley Brennan 6-1, 6-3, in the No. 1 doubles spot. After a disappointing loss earlier in the week, the duo worked hard at Thursday’s practice to improve their footwork and court position, and it paid off. George Bates and Drew Collins-Burke notched a win over Dehoop and Brennan, Henley’s No. 1 team, who stepped in and played an extra match for the Hornets. After splitting sets (6-1, 4-6) the pair prevailed in a third set 10-8 super tiebreaker. The Outlaws were scheduled to play Philomath at home on Monday, April 8, with hopes of upending the defending district champions. They were also scheduled to play Molalla at home a day later, and then wrap up their week with a home match against Cascade on Wednesday. 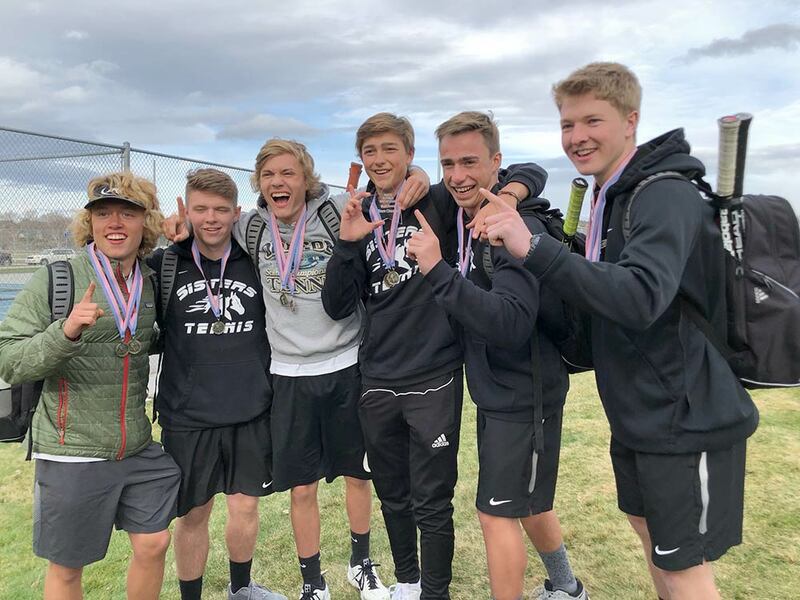 The boys tennis team took first place at the White Buffalo Invitational held at Madras High School on Saturday, April 6, and proved they will be a force to be reckoned with this season. The eight-team event involved a mini-set of seven games against each of the other team’s entries in four divisions, and the champion was determined by the total number of games won. Sisters scored 102 points to finish ahead of Vale and Crook County, who posted scores of 90 and 88, respectively, followed by Madras at?87. All six of Sisters’ players contributed to the team victory, but senior Keaton Green was the big surprise. Keaton’s win in the No. 2 singles division put the Outlaws over the top. Green is playing tennis for the first time this year and usually plays at No. 4 singles, but for this tournament he moved up two positions, and won five of six mini-sets and accumulated the highest total games. Juniors Eli Gurney and Brogan Petterson dominated the No. 2 doubles division to claim the first-place medal. The duo were unbeaten in all six mini-sets. Senior Jed Kizziar and sophomore Nate Weber, who usually trade off at No. 1 and No. 2 singles, played their first doubles of the season. The pair won five of six mini-sets in the No. 1 division, but finished third place in their division. Their 27-game total was just short of the 30 games tallied by Madras and Vale, the top teams in the division. Senior Isaiah Chapen moved up from his usual No. 3 singles spot to the highly competitive No. 1 spot, which featured several players with state tournament experience. Isaiah won one of six contests, but tallied enough games to help the Outlaws to their comfortable 12-point advantage in the team standings.